Let’s take a moment to reflect at where this all begins before it goes any further. We went into the 2011/2012 season with a new owner, new manager and almost a new team after we signed seven new players. Fans were excited at the prospect that we could possibly go on to win a fourth title in a row and after going undefeated for a run of 12 games it looked likely but quickly things began to change on and off the park and on the 14th of February everything changed forever. May 13th 2012, the final day of the 2011/2012 season, one that will not be forgotten in the minds of any fans for a long time. The news broke around 10am that Charles Green and his consortium had agreed an £8.5million bid with Duff and Phelps to buy the club and by that time fans were on buses and headed for Perth to possibly watch Rangers for the last time. Slowly the news began to reach everyone’s phones and the day turned out to be a celebration. The news came from almost nowhere and to quote a familiar song “A light shone in the night” for us fans, after months of darkness and uncertainty it looked like our club was saved. Fast forward over the ups and downs of the summer and we arrive at December. 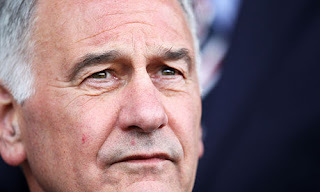 Charles Green appears on Sky News on Jeff Randall Live and when asked if he would consider selling the stadium rights, he responded by saying that everything was for sale. The cracks began to show after these comments, a Rangers fan base that was unified in the summer began to disband into its groups again as this was met with both positive and negative views amongst fans. Money was an ever occurring theme for the fans that were for the idea, with many fans opposing the idea that Ibrox would never again be able to go by its famous moniker. Whilst I respect the views of those that would happily see the stadium change name and those that are against it as both have points that are worth taking in, you have to wonder just how far Charles Green would go if making money is his number one target. We are famous for our royal blue jerseys, if that was to suddenly change and the players emerged from the tunnel wearing a yellow kit, would it still be the same Rangers to you? If the famous lion was to be replaced, would it still be the same Rangers you loved? The answer to that question for me is simply no. Why would we need the extra income, we are about to be playing in the Scottish Second Division not the Championship or Premier League. Scottish clubs will never compete again with English sides because of Sky’s TV deals. If we want to look at re-branding with positive and negative effects look at Cardiff City. 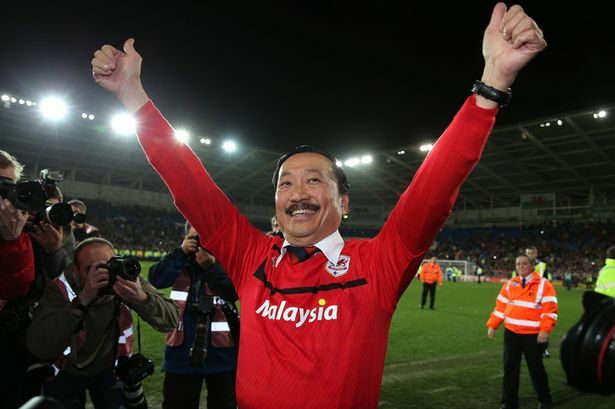 On Tuesday night Cardiff gained promotion to the Premier League, however this wasn’t the same Cardiff who had come so close over the last 4 years to reaching the promise land of the Premier League. This was a club who’s soul and history was flushed down the drain by Malaysian businessman Vincent Tan when he changed the colour of Cardiff’s famous blue kit and changed the logo. He even discussed re-branding the name of the club to the Cardiff Dragons, to increase revenue in the Asian market. Surely this should have been a time for celebration for their fans? Not for a majority who turned their back on the club they used to love. One fan who’s views were made public on the Guardian newspaper website earlier today hit home about the situation we could find ourselves in.."Cardiff City weren't promoted last night. Cardiff City died last summer". A season ticket holder who had decided to give up following his team simply because the team he had grown to love had changed. Now, those who have backed Charles Green over the selling of the stadium naming rights have to stop and think. If the opportunity arose do you think Green, a man who has talked up fans and their support over the last year on numerous occasions, would care about us or about our traditions as a club? If Green wants extra income for this club then may I suggest he takes a quick look around on a match day at Ibrox, what greater source of income than the passionate fans, some who haven’t missed a game this year and paid into the thousands to support the club? If or when Green finally comes clean about his involvement with Craig Whyte maybe then will he see a backing from the Rangers support and get a minority back on his side to create an increase in season ticket sales. Until then people will find it hard to invest the money they work hard to earn, after the debacle we’ve endured over the past 18 months the last thing anyone wants is for Whyte to still be involved. Football without fans is nothing, so if I were Green I’d tread carefully from now on. The BF1 singing area chanted on Saturday their ever growing discontent with Green, the lyrics: "We don’t care about Charles, He don’t care about us, All we care about is Rangers FC" rang around the stadium and if you watched carefully there wasn’t many a fan who wasn’t applauding the mad squad. Here we are almost a full year after Green's takeover and after the news that has broken over the last few weeks it appears there are more questions that we still need an honest answer to than ever before. Green’s actions over the past few months have been questionable at best, I can’t think of a CEO of any other club who features more on the front pages than their team do on the back. He needs to take a break from being in the public eye so much and let things die down or time is going to be running out for Charles Green at this club.